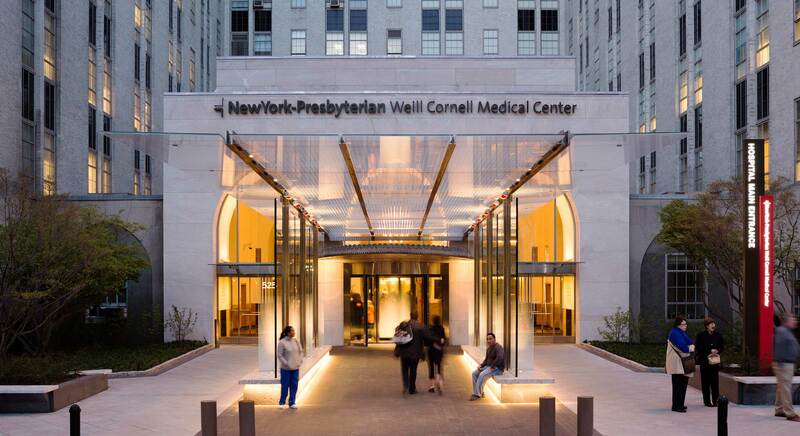 New York Presbyterian Hospital is one of New York City’s leading healthcare institutions. Built in the 1920s this neo-gothic complex has withstood tremendous neighborhood change, renovations and expansions. In 2009 the hospital undertook a redesign of its physical plant and update of its image and identity. A new entry pavilion with a modern glass and stainless-steel canopy, replacing the original cloth awning; creates a protected walkway with natural ventilation, shading and public seating areas. The canopy structure rises from two long benches, that appear to float on a cushion of light. Recessed fixtures uplight the structure, graphics and canopy roof, creating a welcoming procession. The inviting canopy reflects the identity of the hospital while paying homage to its history. The project also included the interior restoration and renovation of the historic lobby.